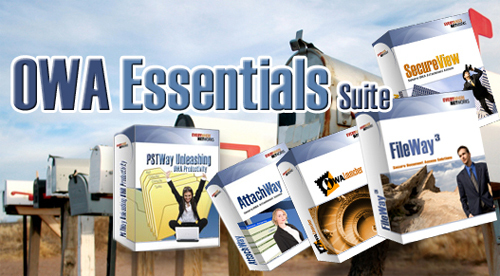 Drive Outlook Web Access Utilization with this set of 5 killer applications, FileWay, AttachWay, PSTWay, SecureView, and OWA Launcher. OWA Essentials turns Outlook Web Access into a powerful enterprise portal and desktop. By incorporating Single-sign-on users can access their corporate data securely. OWA becomes the new portal dashboard for all means of access. One Suite Deal, Get our 5 best applications at one low price. OWA Launcher makes OWA easy to use so it actually gets used.